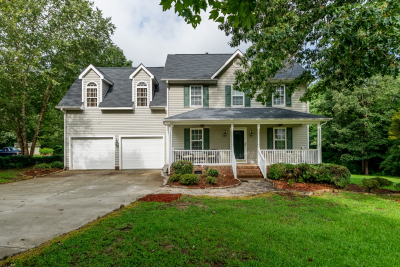 Highly Desired Southern Trace w/ water views on 1.35 acres! Here is your chance to own your own pond! Three bedrooms/Two and a half Ba! Newer Paint/New Carpet! NEW HVAC/New Roof! Kitchen with breakfast nook! Opens to Family Rm w gas log fp! Formal DR with gleaming hdwds! Master Bdrm is cozy with it's on fp! Tub/Shower combo in Master Ba! Large Secondary Bdrms and full ba upstairs! Ovrsizd Bonus Rm! Back Deck has been stained and is perfect for taking in the view! Community Pool! Great location!